The use of a VPN increases our internet surfing and browsing security to a great extent. However, free services could reduce the speed, the amount of data transfer and, of course, security. So, if we want unlimited private surfing, streaming and torrenting, we need a paid VPN. 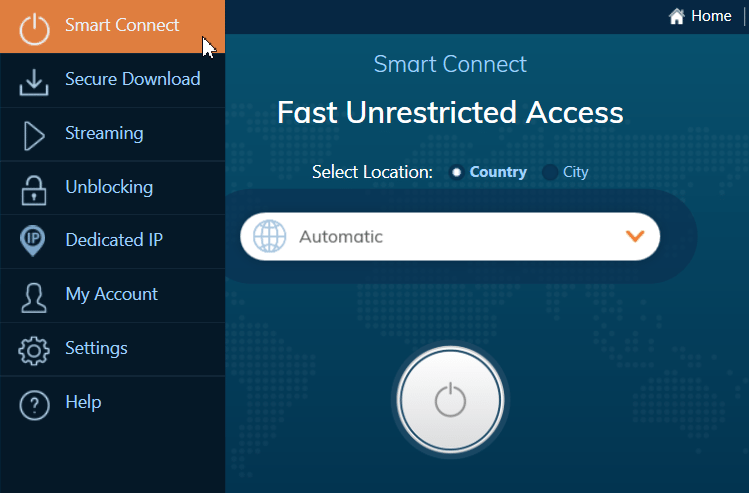 We extensively tested the new Ivacy VPN that offers complete anonymity with fast servers and an Add-on for Kodi. In this guide, we will find out about all the opportunities it provides for the protection of our privacy. For the sake of this testing, we used an optical fiber 50Mbps connection in one of the Greek Cycladic islands. Through this testing, we intended to find out what percentage of our speed we can maintain -depending on the server- by using a VPN. 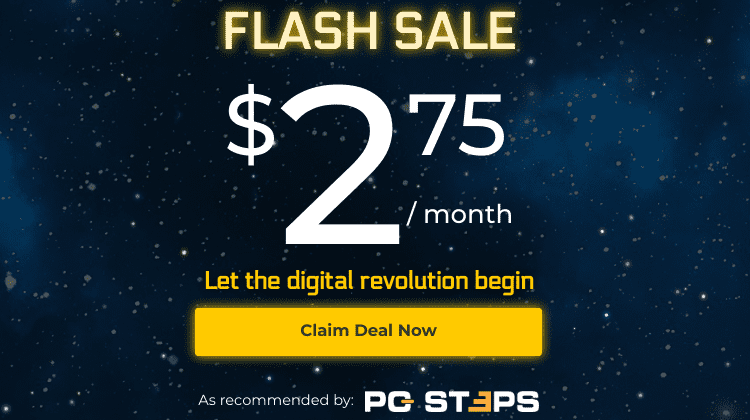 Why choose a paid VPN? 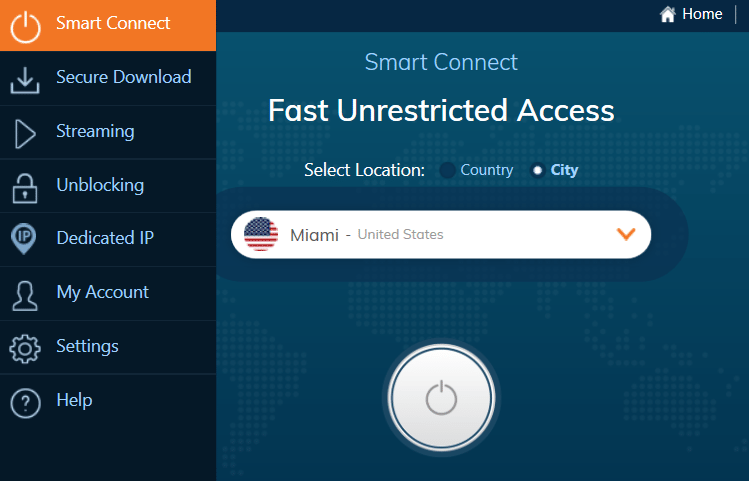 Would you try Ivacy VPN? Perhaps many of us remain exposed to internet hazards while performing our regular online activities, only because we have not yet started using a VPN service. The risk is even higher when we connect to a public WiFi, at a coffee shop or an airport. It is also possible that many of us do not even use a free VPN for a minimum of protection, which we can set by ourselves nice and easy. There is no doubt that free VPNs are good enough to cover our basic needs for anonymous surfing at home or public spaces. At the same time, however, premium VPNs come with significant benefits, at a particularly low cost. Most free VPNs have limits, especially as far as the server selection is concerned. The servers available for the free accounts are fewer and loaded with hundreds or thousands of users at any time. So, apart from reducing the speed, this often leads to instability of the connection. With a paid service, we gain access to a significantly larger number servers, which we share with much fewer users. At the same time, we can connect to servers that are geographically close to us. Both of these factors contribute to us having a faster and more stable VPN. If securing our data and getting the highest speed possible are our most pressing priorities, then investing in a paid VPN is the only way to go. Ivacy VPN has its base in Hong Kong, and it is undoubtedly one of the cheapest options for a fast VPN. It has received good reviews in several technology magazines and websites. 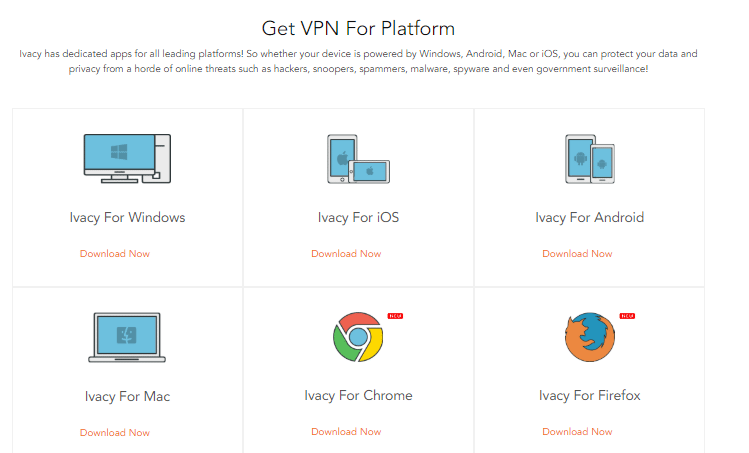 Ivacy VPN can offer high speed, complete anonymity, and the safest downloading and streaming, as we will see next. The updated service offers more than 450 servers from all around the globe. The Ivacy VPN client is one of the simplest out there because we neither have to do much nor set up a lot of functions. It is available for all the major operating systems: Windows, Android, iOS, macOS, and Linux. The application for Windows, which we tried, comes with five profiles. Each one of them corresponds to different settings, depending on the reason for which we want to use the VPN. After the setup, all the profiles appear on the left part of the client, along with the icon of the few manual settings and the respective one of the connection. The first profile is also the most automated one, as our service will choose by itself the fastest server at that given moment. This is a server where we are granted multiple static IP addresses, which are used by hundreds (or thousands) of computers simultaneously. This way, since such a big group of users shares the same IP address, it will eventually offer the final user a higher level of anonymity. One of the main reasons why we should opt for a paid VPN is undoubtedly torrenting. In free services, it is kind of impossible to download a torrent. Some P2P servers of VPN Gate in OpenVPN constitute an exception. However, they compromise the downloading speed dramatically with many interruptions in the meantime. It is very rare to get a downloading speed over 40-50kB/s. In this unit, Ivacy VPN has P2P servers from ten countries which allow torrenting at a relatively high speed. As it happens with all the good VPNs, they are not very different from the respective one that we would have without Ivacy. During our testing, with a WiFi laptop connection -not through the LAN port of the router- we had a very good torrenting speed. Furthermore, this profile is ideal for our portable devices such as our laptop. For example, when we connect to public hotspots, like a coffee shop WiFi, and we want to download several files. 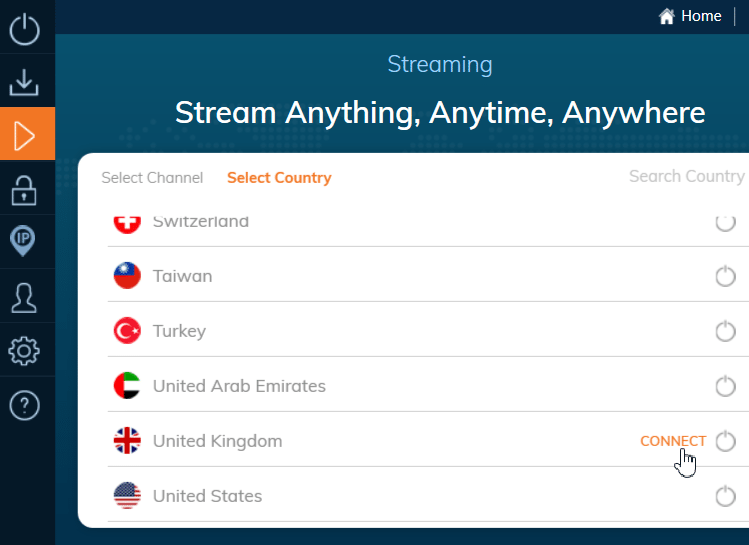 The Streaming profile shows us the servers which are fast and suitable when we want to watch YouTube videos or other multimedia streaming services, Web TV, etc. 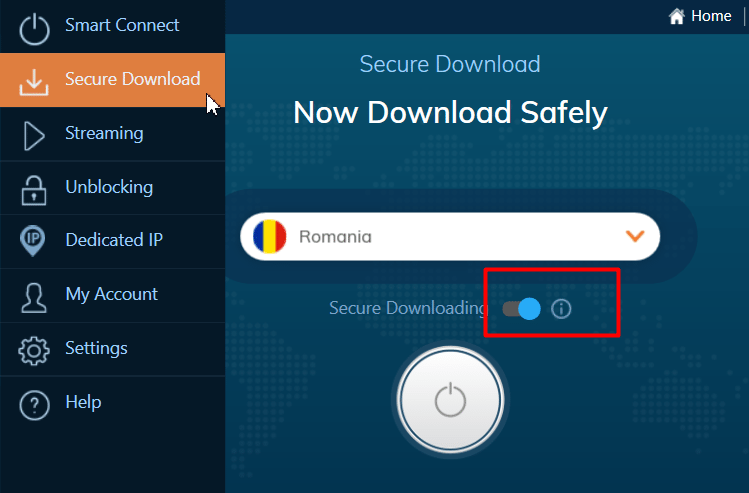 Therefore, all we have to do is select the country we want and right after that click on "Connect" which we can see below. The Unblocking profile shows in an automated way the servers found in countries where the content is forbidden outside the borders. These are, for instance, English TV channels and many more. Furthermore, the service seems to provide a more specific restriction lift through the Streaming section instead of the corresponding Unblocking one. In fact, it gives us the opportunity to recommend the TV channels we want to be unblocked. This section is about the servers with exclusive IP addresses. However, we have to buy the IP. We really can't see why we should proceed with such an extra purchase when other paid services give it for free. We will now present with pictures the results of the tests we have performed with the servers of the main categories we saw before, in comparison with the speed we had without using Ivacy VPN. The measurements took place among five different servers in each category, with the use of an optical fiber 50Mbps connection. We will give the average number. We would say that the differences in the theoretical speed with the foreign servers are relatively small. We haven't noticed any difference in the browsing speed with most servers before and after using Ivacy VPN. As you might have guessed already, Ivacy is relatively easy to use. Just as simple are the extra security functions that the service offers, as well as the few settings which are available on the client. The service also offers the highest level of encryption. It gives us the opportunity to change it, and it has the additional functions "Kill Switch" and "Split Tunneling" that only top VPNs offer. VPN Kill Switch is particularly necessary for public spaces when we transfer data of the utmost importance, and we count exclusively on the VPN to secure them. 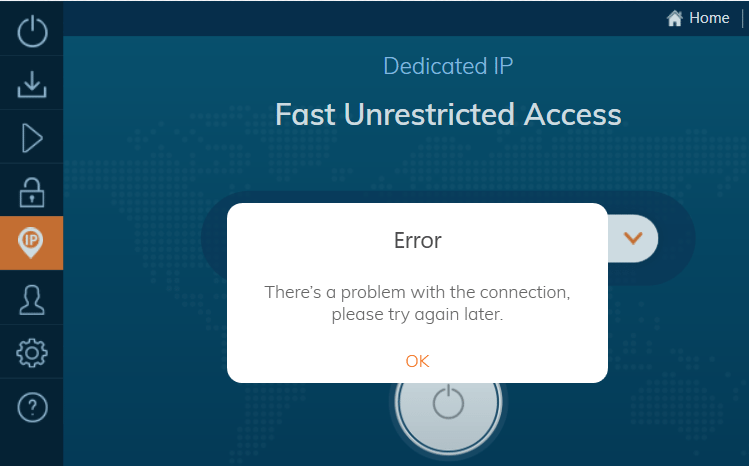 What it does, if the VPN connection fails for any reason, is to stop the Internet connection automatically. This way the computer will not continue using the public and unsafe WiFi. With this tool and by default, some VPNs deactivate simultaneously the selected applications that run on our system at that moment of failure, thus, protecting our sensitive data completely. Ivacy VPN supports all the protocols in the client. On the automatic selection, it gives us the opportunity to choose from high-speed servers with the IKEv2 protocol as default. This is the lightning fast protocol which was developed by Cisco and Microsoft. It supports powerful encryption algorithms, such as AES 256 bit (military grade). 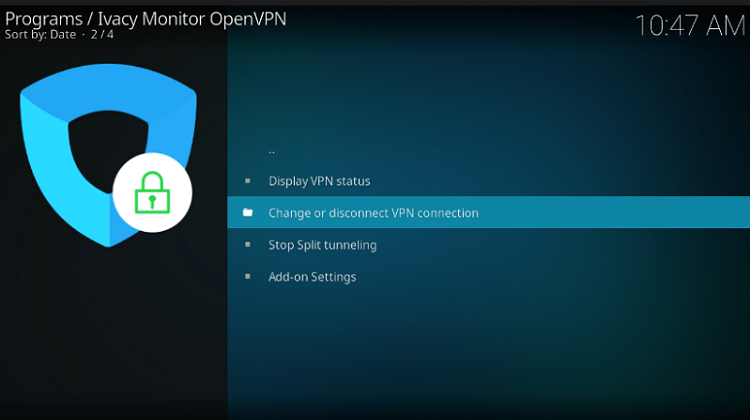 An important and useful function that we have to enable is the automatic VPN connection when our system starts. Also, Ivacy has DNS and IPV6 Leak protection, as we can see below. The service has great technical support. They responded immediately on the LiveChat about the problem we faced with the Dedicated IP. Of course, Ivacy VPN in the premium edition gives us unlimited data transfer, and it supports most operating systems, including Linux. It has a Chrome and Firefox extension. The service provides a particular page with information on its apps, as well as the VPN routers with the open source firmware DD-WRT and Tomato. 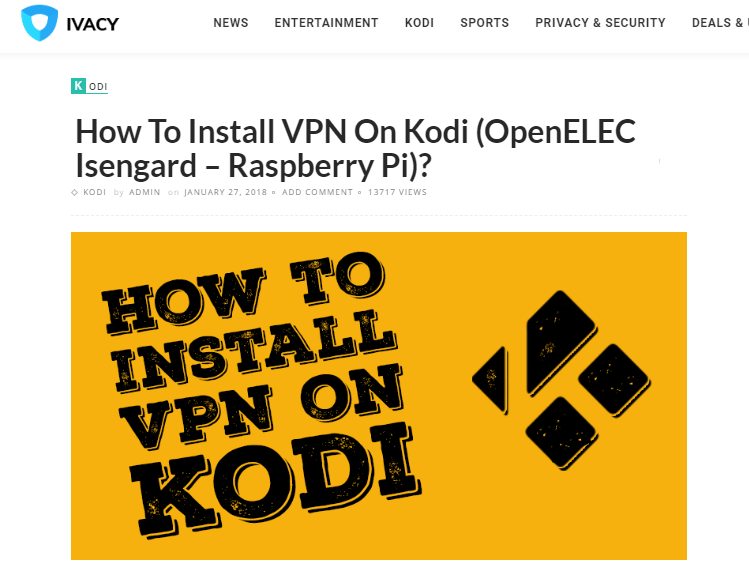 Ivacy VPN has settings for Kodi and gives detailed instructions for the setup of the respective add-on of the service, for all the operating systems. That comes without an extra charge plan. Of course, for Windows, the only thing mentioned about Kodi is that all we need is for the client to be active on the taskbar. The service can keep five simultaneous connections on all our devices, regardless of software. 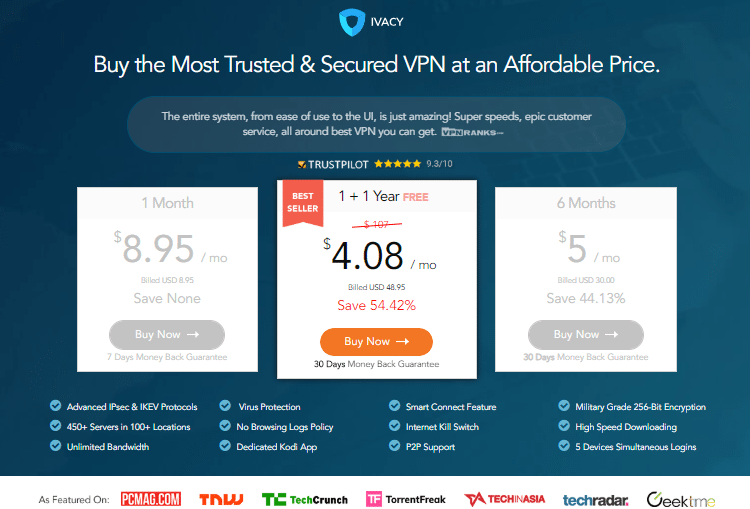 Ivacy VPN is especially cheap, and if we choose the one-year plan, it gives us another year for free. The total cost for two years is 48.95 dollars, which means 2.39 dollars per month. At the same time, it gives us a thirty-day deadline to cancel our subscription and get our money back if we change our mind. It is one of the cheapest VPNs. Satisfactory value for money. Torrent downloading with high speed. It is a fast VPN. Compatibility with all the operating systems and Linux. Has VPN Kill Switch and Speed Tunneling. It is connected automatically upon the start of the computer. It allows a router purchase with a built-in option for VPN through custom firmware. Money refund guarantee within 30 days. In order to connect to other servers, we first have to disconnect from the current server. It does not allow access to settings when it is connected. 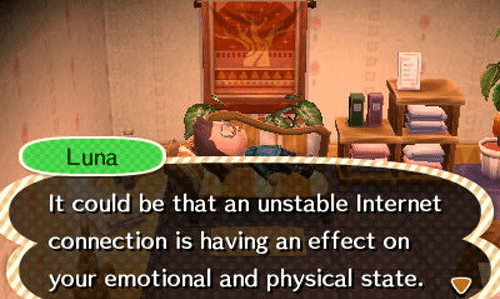 We have to disconnect. Sometimes it is disconnected unexpectedly. 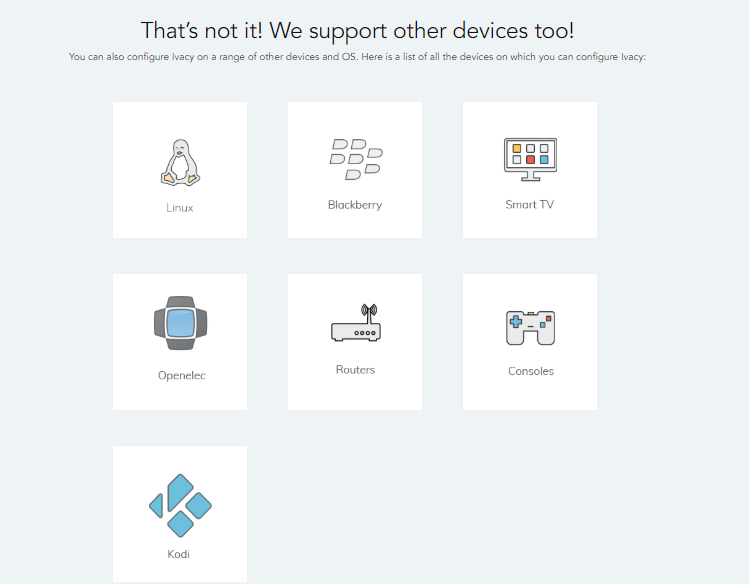 The Kodi add-on is not for beginners, it requires customization, and sometimes errors pop up. 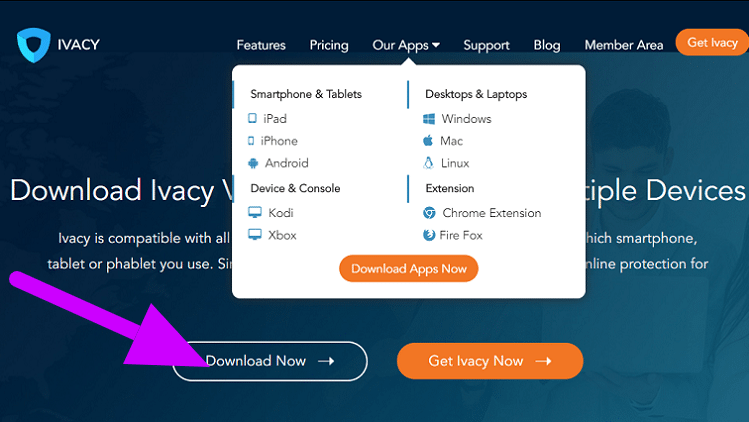 Would you trust the paid Ivacy VPN to secure your privacy and your precious data? If you have any questions about the presentation of this service, you can write to us in the comments below.